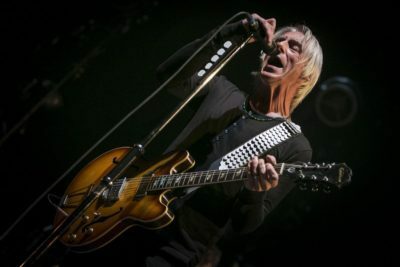 Assured, like a writer and performer of his calibre has every right to be, Paul Weller returned to Bournemouth as he has done for more than 40 years and once again confounded expectations by making it all even better than the faithful might have hoped. Of course he ended with Town Called Malice and the place went wild, but he also found time to essay Jam gems Start! (complete with guest appearance by guitarist Steve Cradock’s son Cassius), That’s Entertainment, English Rose, a radical reworking of Monday and a superbly nuanced Man in the Corner Shop. From his Style Council minutes he revised Shout to the Top and My Ever Changing Moods to the clear delight of the assembled, but also dusted off the long lost Have You Ever Had It Blue? from the Absolute Beginners movie soundtrack. What a tune. Weller’s contribution to British indie film Jawbone, the searching Ballad of Jimmy McCabe was a further highlight of the acoustic interlude that comprised the first encore. It followed a killer set in which our host more than delivered on his promise to play “new songs, old songs, all sorts”. From the first category the tasty gumbo of groove and song-craft that is his most recent album A Kind Revolution was amply represented by the bristling heat of Woo Sé Mama, Nova’s cosmic urgency, the spiritual elegance of The Cranes Are Back and the transcendental observations of Hopper. The second was made good with early solo singles including Hung Up, the woozy Above the Clouds and a rousing revival of The Weaver as well as the obligatory You Do Something To Me; while the third was covered by a brilliant new twist on The Jam’s Eton Rifles, an inventive acoustic take on Out of the Sinking and the hard edged abstract R&B of Into Tomorrow. Simply put, it was a hell of a night, but perhaps the key to the whole affair was delivered right at the top of the show, in the classy elegy to serenity from the Saturn’s Pattern album – I’m Where I Should Be. I’m Where I Should Be, White Sky, Nova, From the Floorboards Up, Long Time, Saturn’s Pattern, Are You Going My Way?, Have You Ever Had It Blue?, My Ever Changing Moods, She Moves With the Fayre, Man in the Corner Shop, Above the Clouds, Into Tomorrow, Up In Suze’s Room,Hung Up, Shout to the Top, The Cranes Are Back, You Do Something To Me, Woo Sé Mama, Friday Street, The Eton Rifles, Start!